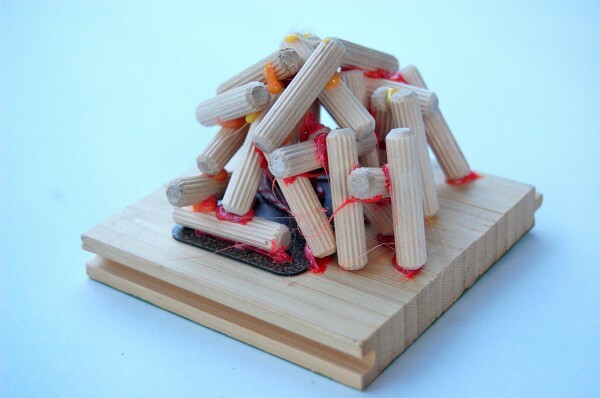 If you happen to have a big bag of dowel pins sitting around like we did (thank you, IKEA, for making that necessary), Scrap Wood Sculpture is a fun way to put them to good, creative use. No dowel pins? 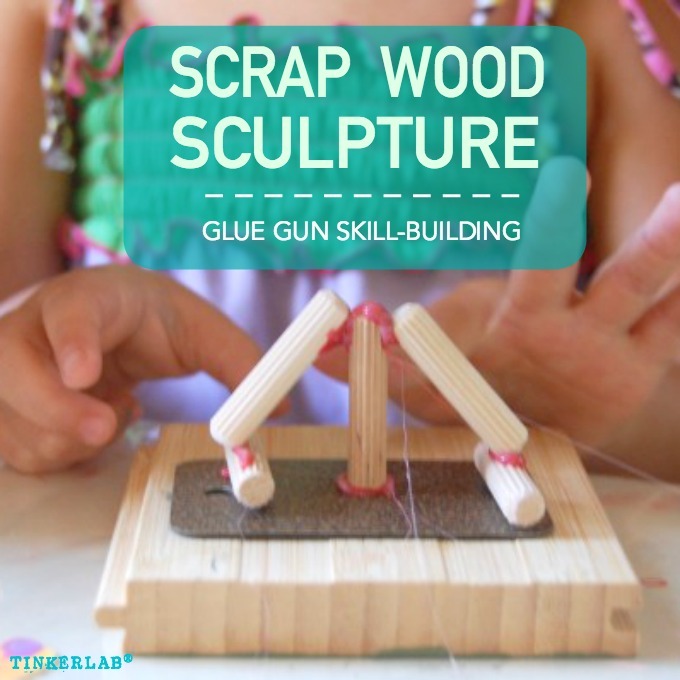 You can have fun building glue-gun skills with kids with just about any collection of small pieces of scrap wood. Dowel Pins. Another option are these wooden spools or even corks! 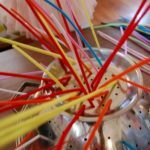 Colored glue gun sticks. Clear glue is a-okay. We like to mix it up with color for extra fun. Place the dowel pins or wood scraps in a bowl. Add colored glue sticks to your glue gun for a fun variation on the usual — clear glue is also just fine! Introduce your child to the glue gun: While the low-heat gun should not cause any burns, it’s still smart to exercise caution when using it. Explain that you shouldn’t touch the metal tip nor the warm glue as it comes out. 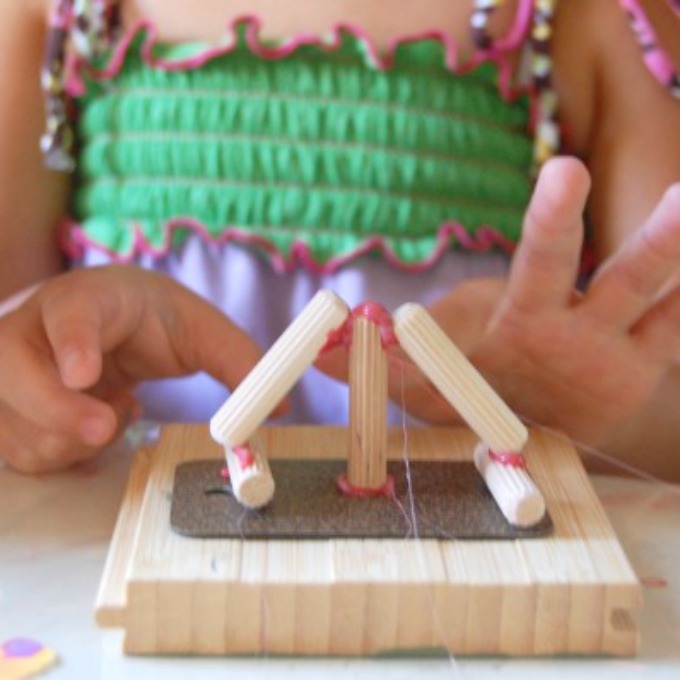 Young preschoolers may need extra help squeezing the glue gun. 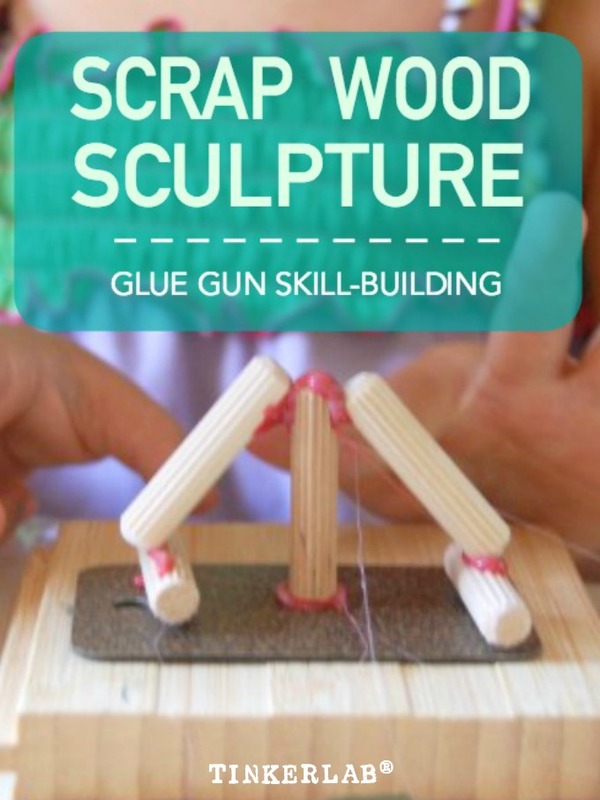 This is an excellent way to build fine motor development and work on hand strengthening. 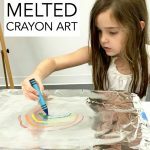 Invite your child to connect and build a sculpture using her imagination. Give your sculpture a title. Make a few pieces and create museum-style labels for them. Set up a sculpture gallery and invite family members to view the art. 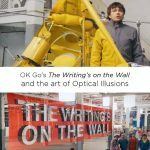 Ask you artist to explain her work. 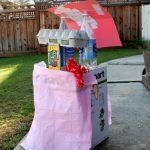 Make an invention kit for open-ended discovery and creativity! 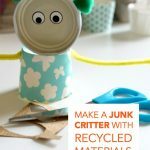 Build found object art — these junk critters are adorable! 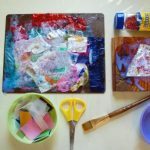 Try your hand at recycled sculpture — this is a good one for young preschoolers! I do wood sculptures every year with my 4 year old kindergarten class using wood donated from parents and cabinet makers. We have used wood glue that they paint on with a brush and works well for us with 18 or more students working at the same time. 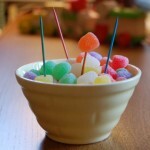 It is so interesting how they work on balancing items as well as decorating their pieces. Hi Sue! I’m so glad you mention using wood glue and donated wood scraps. 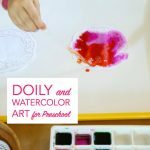 What a great low-cost activity this is! 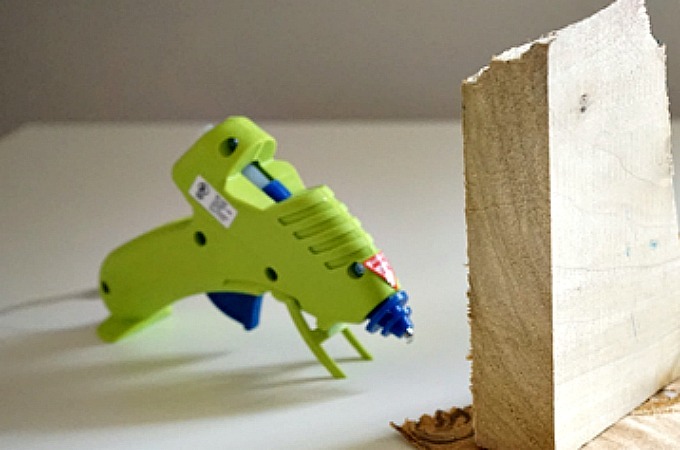 Wood glue works so well, really challenges children to figure balance out (as you say), and of course it’s far easier than a glue gun with so many kids.